If You Think This is Cold – Icy Days on The Bay – Chesapeake Chapter U.S.L.H.S. As the cold weather settles over much of the country have you been daydreaming of warmer weather and maybe the quiet life of a lighthouse Keeper from days past? The allure of lighthouses often contains romanticized visions of existence in pristine, wild places with Keepers filling free time with fishing or watching the boats go by. It does not usually contain the vision of harsh winds, freezing temperatures and isolation. Here in the mid-Atlantic region this season has given us a taste of those less favorable conditions with the average temperatures nearly 20 degrees below normal. This is not the type of weather that inspires those romantic visions of life on a lighthouse. But these unseasonably cold temperatures did reminded me of a first-hand account of one winter on Thomas Point. 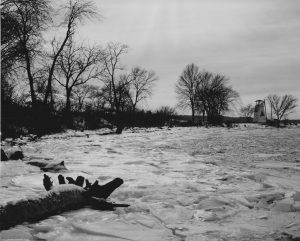 Winters on the Chesapeake Bay can sometimes be severe and while there has been a significant amount of ice this season – it does not compare to some past winters. One of those was described to me by Frank Remaly now retired from the U.S. Coast Guard. Note: We don’t have a picture of an iced up Thomas Point – but I have included one of Ft. Washington to set the atmosphere! Frank was in charge of automating the Thomas Point lighthouse. He weathered (pardon the pun) his first ice storm in the Chesapeake in the winter of 1985. It was the year the Bay would experience one of the most intense arctic outbreaks of cold air in the 20th century with temperatures reaching record lows at National Airport. When Frank and his partner arrived for their two week rotation crew change it was clear, around 28 degrees and sunny. The crew change went smoothly as two men left and two men came aboard. They loaded supplies, stowed their food and gear and fell into their 12 on 12 off routine. The forecast was for much colder weather and a warning that the bay would start to ice over. This proved correct and when Frank later went up to uncover the lens and lower the flag the wind was blowing right up the bay and the temperature was dropping. The winds continued to ramp up and by the next weather report they were up to about 20 knots with higher gusts and the temperature was 20 and still dropping and the ice now started to form. By his next 12 hour shift, the light had accumulated enough ice so that the Galley door would not open and the windows were iced over. Over the next watch the weather continued to pound the little cottage and ice now covered the walkways. The two men put on their Imperial survival suits, roped themselves together and as walking was impossible, they crawled on hands and knees to the small boat and hoist which they covered in case they would need it at some point. After this experience they decided that come daylight they would have to try and remove some of the accumulating ice. As the sun rose it was still snowing hard so they kept the light on. They also decided it was too dangerous to have anyone outside alone. They donned their survival suits and as much clothing as they could wear and still work and went back out to knock off the accumulated ice with wood bats and sledge hammers. The work was hard and tiring with the ice coming off easily in some areas such as the railings but was proving very stubborn in others such as the walkways. They started on the boat hoist side first and got as far as the outhouse before they had to quit for the day. The next days were a replay of the first as they worked at a slow and steady pace. After several days the wind had actually stopped and shifted around so it was coming from the north. While it got colder, at least there was no new icing. By day ten they had finally cleared all the iced-up walkways. But now the bay was freezing over and it was still very cold and snowing periodically. They turned their attention to the siding on south side of the light were anywhere from 2 to 6 inches of ice had accumulated. They would start at the top and timing their blows to land at the same time they were able to get the ice off without damaging the lighthouse. The normal rotation was two weeks on and two weeks off. I think this must have been one of the most arduous two weeks spent on this lighthouse and they were, I believe more than ready for their reliefs to come out. So now they turned their attention to the hatch which they had to get open in order to leave. They were stunned when they were finally able to open it only to find tons of ice on the ladders and the lower platform. They again had to tie themselves off as they worked their way down the ladders with one man belaying the other using a nylon line looped around the boat hoist. As Frank explained this freed the worker to use both hands, the crampons they were using gave them some footing, but slips and falls were common place. When the relief crew arrived they had to send them away as there was no safe landing area yet. They told them to call in every day to find out when they could come back. By this point all their fresh food supply was gone, and they had to fall back on the canned goods of which, fortunately they had plenty. They worked on the lower platform using any tool that would help remove the ice as they struggled to open a path about three feet wide from the ladder to the landing. As Frank explained “This work on the lower platform was brutal to say the least, as the wind was blowing snow over the top of the ice, it was like trying to work in a sand blaster, plus the man working would over heat while the other belaying him froze.” They switched places very often just to try and even it out. They had been out there three weeks performing their normal duties as well as trying to remove tons of ice from the light when they were finally able to call and get the relief crew out there. Frank said he had never seen ice form like this even aboard cutters while serving up in Alaska. Their reliefs had their own nightmare of frozen water pipes and tanks. But that is another story. So next time you grumble about the cold – just be thankful you do not have fight your way out of an iced up lighthouse in the middle of a record breaking arctic blast of cold air.